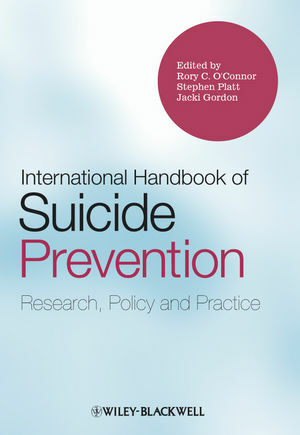 The International Handbook of Suicide Prevention showcases the latest cutting-edge research from the world’s leading authorities, and highlights policy and practice implications for the prevention of suicide. Rory C. O'Connor is Professor of Psychology at the University of Stirling, where he leads the Suicidal Behaviour Research Group. Professor O'Connor is also President-Elect of the International Academy for Suicide Research, Honorary Professor of Psychology at the University of Nottingham and he serves on the editorial board of Suicide and Life-Threatening Behavior, Suicidology Online, Psychology & Health and Journal of Behavioral Medicine. He has published extensively in the field of suicide and self-harm. Stephen Platt is Professor of Health Policy Research at the University of Edinburgh. His research interest in mental health and suicidal behaviour spans over 30 years, and he is involved in policy development and analysis relating to public mental health and mental health improvement. Jacki Gordon is an independent consultant in Public Health research and evaluation. She previously worked for the Scottish Government where she had lead national responsibility for improving the evidence base for suicide prevention and translating it into policy and practice. She is the co-editor of How We Feel: An Insight into the Emotional World of Teenagers (with G. Grant, 1997). Introduction (Rory C. O'Connor, Stephen Platt, and Jacki Gordon). Part I Suicidal Determinants and Frameworks. 1 Challenges to Classifying Suicidal Ideations, Communications, and Behaviours (Morton M. Silverman). 2 International Perspectives on the Epidemiology and Aetiology of Suicide and Self-Harm (Kirsten Windfuhr and Navneet Kapur). 3 Depression and Suicidal Behaviour (Zoltán Rihmer). 4 Schizophrenia, Other Psychotic Disorders, and Suicidal Behaviour (Alexander McGirr and Gustavo Turecki). 5 Substance Use Disorders and Suicidal Behaviour (Kenneth R. Conner and Mark A. Ilgen). 6 Personality Disorders and Suicidal Behaviour (Joel Paris). 7 Deliberate Self-Harm: Extent of the Problem and Prediction of Repetition (Ella Arensman, Paul Corcoran, and Anthony P. Fitzgerald). 8 Relationships of Genes and Early-life Experience to the Neurobiology of Suicidal Behaviour (J. John Mann and Dianne Currier). 9 Understanding the Suicidal Brain: A Review of Neuropsychological Studies of Suicidal Ideation and Behaviour (Kees van Heeringen, Karen Godfrin, and Stijn Bijttebier). 10 Present Status and Future Prospects take up the Interpersonal–Psychological Theory of Suicidal Behaviour (Jessica D. Ribeiro and Thomas E. Joiner). 11 Towards an Integrated Motivational–Volitional Model of Suicidal Behaviour (Rory C. O'Connor). 12 Worrying and Rumination as Proximal Risk Factors for Suicidal Behaviour (Ad Kerkhof and Bregje van Spijker). 13 Inequalities and Suicidal Behaviour (Stephen Platt). 14 Religion and Suicide: Integrating Four Theories Cross- nationally (Steven Stack and Augustine J. Kposowa). 15 Rurality and Suicide (Cameron Stark and Vincent Riordan). 16 Body Weight, Obesity, and Suicide across the Life Course (David Gunnell and Kyla Thomas). Part II Intervention, Treatment, and Care. 17 Evidence-based Prevention and Treatment of Suicidality in Children and Adolescents (Cendrine Bursztein Lipsicas and Alan Apter). 18 Prevention and Treatment of Suicidality in Old Age (Diego De Leo and Urška Arnautovska). 19 Clinical Care of Deliberate Self- Harm Patients: An Evidence- based Approach (Keith Hawton, Tatiana L. Taylor, Kate E. A. Saunders, and Su Mahadevan). 20 After the Suicide Attempt: The Need for Continuity and Quality of Care (Lars Mehlum and Erlend Mork). 21 Treating the Suicidal Patient: Cognitive Therapy and Dialectical Behaviour Therapy (Nadine A. Chang, Barbara Stanley, Gregory K. Brown, and Amy Cunningham). 22 Clinical Trial Feasibility Studies of the Collaborative Assessment and Management of Suicidality (David A. Jobes, Katherine Anne Comtois, Lisa A. Brenner, and Peter M. Gutierrez). 23 Modes of Mind and Suicidal Processes: The Potential Role of Mindfulness in Changing Minds (J. Mark G. Williams, Danielle S. Duggan, Catherine Crane, and Silvia Hepburn). 24 The Role of the Therapist in the Treatment of the Suicidal Patient (Konrad Michel). 25 Recognition of Suicide Risk, Crisis Helplines, and Psychosocial Interventions: A Selective Review (Rory C. O’Connor, Susan Rasmussen, and Annette Beautrais). 26 Antidepressants and Suicide Prevention (Robert D. Goldney). Part III Suicide Prevention: Bringing Together Evidence, Policy, and Practice. 27 Suicide Prevention Strategies: Case Studies from across the Globe (Gergö Hadlaczky, Danuta Wasserman, Christina W. Hoven, Donald J. Mandell, and Camilla Wasserman). 28 Suicide in Asia: Epidemiology, Risk Factors, and Prevention (Murad M. Khan and Ehsan Ullah Syed). 29 School-based Strategies for Youth Suicide Prevention (Alison M. Lake and Madelyn S. Gould). 30 Media Influences on Suicide and Attempted Suicide (Jane Pirkis and Merete Nordentoft). 31 Suicide Prevention through Restricting Access to Suicide Means and Hotspots (Ying-Yeh Chen, Kevin Chien-Chang Wu, and Paul S. F. Yip). 32 The Sequelae of Suicide: Survivors (Onja Grad). 33 Challenges in US Suicide Prevention Public Awareness Programmes (Jane L. Pearson). 34 What Kind of Research Do We Need in Suicidology Today? (Heidi Hjelmeland and Birthe Loa Knizek). 35 Understanding the Relationship between Mental Illness and Suicide and the Implications for Suicide Prevention (Brian L. Mishara and François Chagnon). 36 Achievements and Challenges in Suicidology: Conclusions and Future Directions (Rory C. O'Connor, Stephen Platt, and Jacki Gordon).